A 38 North exclusive with analysis by Nick Hansen. 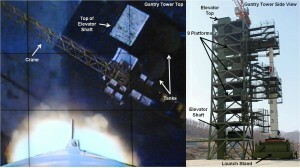 The Sohae gantry tower has been undergoing significant modifications to enable it to launch a large rocket up to 25 percent longer than the Unha-3 space launch vehicle tested in 2012. It is unclear when that rocket will be ready. Because of construction, the pad will not be available for launches until March/April 2014 at the earliest. 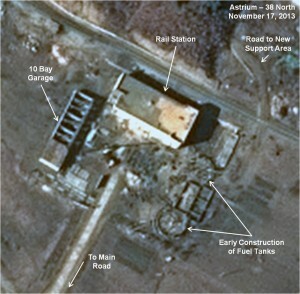 Construction has continued since summer 2013 on a growing number of projects consistent with preparations for using Sohae as a training and launch facility for North Korea’s new generation of regional and intercontinental-range mobile missiles. The latest projects are the construction of two 45,000-gallon tanks that could be used to fuel vehicles in mobile missile units and a pad possibly intended for use by those units for training. A possible test of a rocket engine used by the road-mobile KN-08 intercontinental ballistic missile took place between late December 2013 and early January 2014. Imagery from late December indicated the presence of what appears to be a rocket stage consistent with the KN-08 ballistic missile’s first stage and possibly a crane that would be used to place the engine into the test stand and remove it after a test. Imagery taken two weeks later showed that the rocket stage and other equipment were gone. While modification of the gantry tower used for previous Unha-3 rocket launches has been ongoing since late 2013, recent satellite imagery indicates definitively that the work is intended to allow future launches of larger rockets by adding an upper platform to the tower as well as making changes to the mobile launch stand. 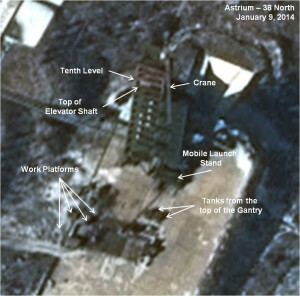 One possibility is that the gantry and pad are being modified to handle a large 40-meter long rocket based on the mockup reportedly spotted at the Sanum-dong missile facility outside Pyongyang in April 2012. Moreover, the modified gantry will be able to enclose the payload—including new generations of DPRK satellites—and provide room under a cover to work on it. Prior to recent construction, the gantry tower—consisting of nine levels with only the lower seven built out for the Unha rocket—remained unchanged since it was completed in 2010 (figure 1). The tower was about 47 meters high, not counting the crane at the top, and the spacing between the levels was approximately 4.5 meters. Both the ground level and the mobile launch stand were 7 meters high. The 30 meter long Unha rocket, setting on the launch stand, only used 37 meters of the gantry. The two additional levels present at the top were not built out or used for the Unha, indicating that the tower was designed to launch larger rockets. Figure 1. Original Unha-3 Gantry. Image left: Voice Of America/Sungwon Baik; Image right: Associated Press. The build out of the top of the tower began in October 2013 including the addition of a tenth level. Structural steal beams for the new platform were first seen on the pad that month and work modifying the mobile launch stand also appeared to have started. By mid-November, the new upper platform was taking shape. The top pair of swiveling work platforms on the eighth and ninth levels had been removed to facilitate the addition of the tenth level and placed on the pad. By late December 2013, a second pair of swiveling work platforms was being assembled on the pad, probably to attach to the new level that was then nearly complete. Throughout this period work appears to have continued on the mobile launch stand (figure 2). When the modifications are finished, the tower should measure 52 meters high, not including the crane. It will be able to handle a large rocket 40-43 meters in length sitting on the same 7 meter high launch stand. Modification of the mobile launch stand may be intended to increase its diameter to handle the larger first stage of the new rocket. (The diameter of the Unha’s first stage is 2.4 meters while the new rocket’s first stage diameter may be 3-3.5 meters). Based on the current pace of work, the modifications could be completed by March or April 2014. Until then the pad will be out of commission and unable to conduct launches. Since most of the work is being done on the top portion of the gantry not used by the Unha, the modified pad will most likely be able to continue launches of that rocket as well as larger ones. Figure 2. Modified Unha-3 Gantry and Launch Stand. Continued Preparations for Mobile Missile Training and Launches? There has been a continuing debate in the Western expert community about North Korea’s new generations of mobile missiles—the Musudan regional range rocket and the KN-08 road-mobile international range ballistic missile (ICBM)—spotted in military parades in Pyongyang. A key question is whether these missiles are, in fact, real, and if they are, why haven’t they been tested. Others, including the US government, would argue these are real weapons still in the process of development for eventual deployment. Earlier 38 North analysis pointed to preparations for future tests of new North Korean road-mobile missiles at the Sohae facility. Test launches of the Musudan intermediate-range ballistic missile and the KN-08 intercontinental ballistic missile would allow them to travel to full ranges—an estimated 2500-3500 kilometers and 6000+ kilometers respectively—without flying over a foreign land mass. (Launches from the older test range at Tonghae are restricted to about 900km.) Moreover, unlike the Tonghae test site, a rail line leading to the Sohae facility could transport mobile missile units to and from the site, saving time, and money as well as vehicle wear and tear. 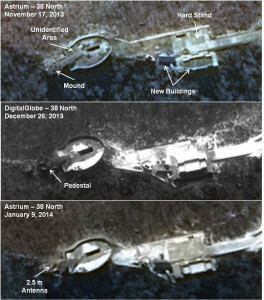 Recent developments at Sohae included what appeared to be the construction of two flat launch pads that are typically used for tests of mobile missiles. However, since the new sites were still at an early stage of construction, it was difficult to make a definitive judgment on the purpose of these activities. Figure 3. 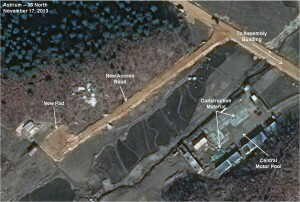 Overview of Construction Activities at the Sohae Facility. 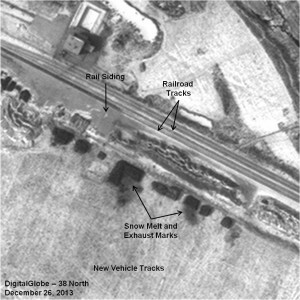 Wheeled Vehicles: Approximately twelve wheeled vehicles, parked in a field and covered with canvas, arrived at the Sohae rail siding between late 2013 and early 2014 (figure 4). While the vehicles are covered with canvas, increased traffic would be consistent with the eventual deployment of mobile missile units to Sohae. One vehicle is 14 meters long, two are 12 meters in length, and the rest are 5-6 meters. Since none are long enough to be the Transporter-Erector-Launchers (TELs) for either the Musudan or the KN-08 missiles (17.3 and 21.4 meters long respectively), if these vehicles are related to mobile missile units, they are more likely intended to support operations, i.e. for fueling, command, control and communications, security, maintenance or troop support. Figure 4. First Appearance of Possible Missile Support Vehicles. 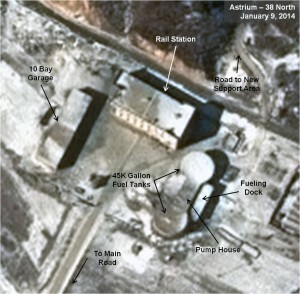 New Vehicle Support Area: Satellite imagery indicates that the North Koreans are building a vehicle support area near the rail station including two large storage tanks—each capable of handling about 45,000 gallons of diesel fuel—separated by a pump house and fueling dock. Tank cars parked on the nearby rail tracks can refuel these tanks (figure 5). A road under construction connects the new support area with the fueling dock a short distance away. Also completed late in 2013 was a ten bay garage, probably for smaller vehicles (figure 6). Overall, one explanation for the large-scale expansion of facilities to handle road vehicles is that Pyongyang is preparing Sohae for periodic deployments of mobile missile units for training and launches. Figure 5. Rail Station Construction in Mid-November 2013. Figure 6. New Facility Construction near Sohae Rail Station. 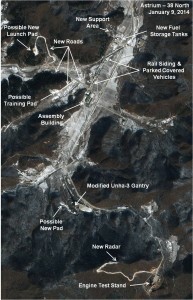 Practice/Training Pad: Recent satellite imagery also indicates the construction of a possible practice/training pad near the center’s motor pool and rocket assembly building. If this proves to be the case, the pad would be additional evidence that activities at Sohae are intended to support mobile missile training and launches. Such a pad, typically located in other countries at test ranges, might be used by mobile missile units to train in all facets of operations that take place prior to a launch, including driving the vehicles, missile handling and fueling, command and control, and logistics. However, it is important to note that unless the pad is enlarged or a loop road built leading to it, the area as it currently is configured is not suited for the 21 meter KN-08 TEL. Tree clearing began in early October 2013. By mid-November, the 200 meter road leading to the 20 by 20 meter flat pad was nearing completion (figure 7). No additional work had been done as of early January 2014 with images showing a snow-covered road. The road and pad appear built to handle large, heavy vehicles of the type that would typically be part of a mobile missile unit. Moreover, the road connects the pad and the nearby rocket assembly building, which could be used for assembling mobile missiles and sheltering their large TELs. Figure 7. Possible Training Pad for Mobile Missile Units. Improved roads and bridges at these areas able to allow use by heavy vehicles—including TELs—found in mobile missile units. 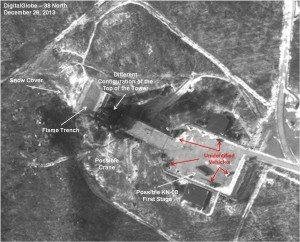 In late December 2013, satellite imagery indicated activity at the Sohae rocket engine test stand that, in the past, has been typical of North Korean preparations for firing a rocket engine. Present on the stand is what appears to be a large rocket motor stage whose dimensions (9 meters long by 2 meters wide) are consistent with the first stage of the KN-08 road-mobile intercontinental-range ballistic missile. 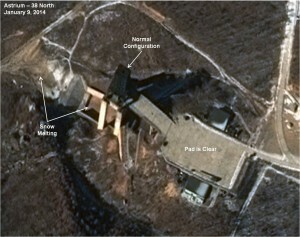 (These dimensions and the shape are not consistent with any other known DPRK rocket.) Six other small vehicles and objects are present on the stand as well as what appears to be a crane near the test tower that would be needed to load the engine into the stand and then remove it after the test. Since the next available imagery is from January 9, 2014, there is only limited evidence to suggest that the test has taken place. Seen in late December, the hole at the top of the tower was moved near the back and several white objects were present. Because gas buildup inside the tower during an engine test could produce an explosion or fire, the North Koreans may have removed or rolled back the top of the tower to better vent fumes. By January, there appeared to be a single vent hole at the center of the top of the tower, its normal position when the site is inactive. In addition, the possible rocket stage, vehicles and crane are no longer present. Finally, the snow has melted in front of the flame trench, either as the result of a test firing or natural melting (figures 8-9). Figure 8. Preparations for a Possible Rocket Engine Test. Figure 9. Stand After Possible Test. While the North Koreans used a mobile radar to track the 2012 launches of the Unha rocket, satellite imagery from late 2013 into January 2014 indicates that Pyongyang is upgrading its instrumentation site, a sign that Sohae may have a more active launch program in the future. In addition to the construction of two buildings, a concrete hard stand to park instrumentation vehicles that gather data on rocket launches, and an upgraded road leading to the site, the North Koreans are installing a permanent radar tracking system. The new dish antenna is 2.5 meters in diameter and can be used to track both space launch vehicle and missile tests. A horseshoe shaped mound is visible with a ramp up to the radar and appears to also have a stairway leading down into a bunker. Its function may be to operate the radar (figure 10). Figure 10. Construction of a Permanent Instrumentation Site.